Keteli or Creeping thistle (cricus arvensis, family: asteraceae) is an erect perennial herb, attaining a height of 40-120 cm. It grows on cropland or on the edge of lands in Bangladesh. Its stem and leaves are covered with cobwebby hairs. Spiny leaves are simple, dented, unevenly wavy, sessile, usually 7-10 cm long and 1-3 cm wide. Flowers are small, pink, borne on head. Single flower is soft as a feather. Male and female flowers bloom on separate inflorescences. The infloresence bearing male flowers is round and the one bearing female flowers is oblong. The fruit is an achene, having brown pappus and looking glaucous and glabrous. Mature seeds are cotton-like fiber which can spread far and wide. It is mostly found in the rural areas of the country. By the by, the flowering time of the plant is spring. Shinduri bij or Achiote (bixa orellana, family: bixaceae) is an evergreen shrub or small tree with few branches and dense foliage. Dye extracted from seed is used to color ointment. Its original home is tropical America. Red Indians paint their body and lips by the color obtain from its seeds. Shinny leaves are green, heart-shaped with pointed apex, veins and midribs are clear; 10-18 cm long and 6-12 cm wide, alternate, petiole, 5-7 cm long. 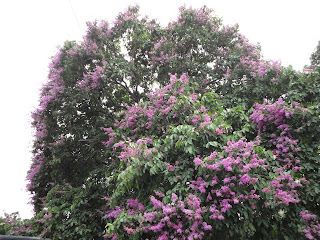 Flowers are very attractive, showy, purple-white, 5 cm across, borne on upright terminal panicles, 7-12 cm long; sepals 5, petals 5, with many stamens. Flower blooms in Autumn-winter. Fruits are also attractive. They are globose, 3-5 cm across, covered with soft reddish prickles. Seeds covered with a thick red pulp which yields a valuable dye. Leaf, root and seed are used in preventing fever, gonorrhea, jaundice, dysentery and urinary problem. Roti, kuch or Jequirity (abrus precatorius, family: fabaceae) is a deciduous creeping woody herb. It grows naturally on fallow lands and beside canals and ponds. Nowadays it has been rare in Bangladesh. In epic Mahabharata and Indian classical poetry it is known as Gunja. Leaves are compound; leaflets 10-20 cm on a rachis, opposite, tastes sweet. Blades are oblong, midrib clearly visible. Flowers are small, pinkish white. Flowers bloom in summer. Fruits are bean-like. When the bean dried up, it burst. Seeds are round, brilliant red but have black mark at the top. All the seeds are almost of the same weight and shape. The extensive creeper is propagated by seeds. Other names: Rotti, Rottika, Lalkuch, Roktokuch, Rokta, Shonakuri, Churamoni, Tamrika, Shangushtha, Gunja. Bottlebrush or Lemon bottlebrush (melaleuca citrina, family: myrtaceae) is a medium-sized evergreen tree with profuse branches, sometimes shrubby in nature and semi-deciduous or completely deciduous. It is famous for its beautiful drooping branches and brilliant red 'bottlebrush'-like flowers. Leaves are narrow, lanceolate, alternate, about 3-6 cm long and 1 cm wide, without pedicel, green or silvery green. Flowers are small and bloom on spike inflorescence. Stamens are dark red, numerous and bigger than petals. Flower appears round the year. Tiny fruits contain numerous seeds. Propagation is by air layering and seeds. As decorative plant it is planted in the park and gardens in Bangladesh. If crushed, leaves emit a kind of aroma that scented like lemon. That's why the species name of the plant is 'citrina'.